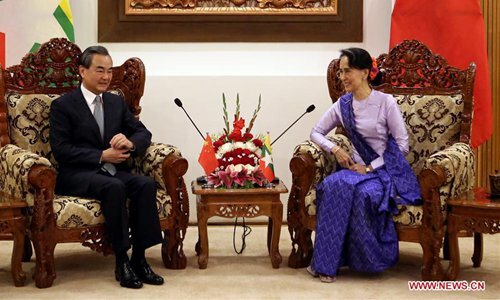 China and Myanmar on Sunday vowed to further promote their bilateral relationship and deepen their pragmatic cooperation. The pledge came during talks held between Myanmar's State Counsellor and Foreign Minister Aung San Suu Kyi and visiting Chinese Foreign Minister Wang Yi. Wang said China regards Myanmar as an important partner in the joint development of the China- proposed Belt and Road Initiative, noting that China and Myanmar enjoy obvious complementarity. He said China stands ready to work on an economic corridor between the two countries according to Myanmar's national development plan and its actual needs so as to further strengthen China-Myanmar comprehensive strategic cooperative partnership and deepen bilateral pragmatic cooperation. At the talks, the Chinese minister stressed that China and Myanmar, linked by mountains and rivers, are neighbors with "paukphaw" ("fraternal" in the Myanmar language) friendship and China firmly supports Suu Kyi in governing the country in line with the will of the Myanmar people. China also firmly supports Myanmar in its efforts to uphold the country's sovereignty, independence, security and dignity as well as in its endeavours to realize the national reconciliation, he said. Wang expressed the hope that relevant parties in Myanmar follow the "Panglong" spirit and realize long-standing peace at an early date through friendly consultations. Suu Kyi, for her part, said that what Myanmar people most want now is peace, stability and development, highlighting that it is of utmost importance for Myanmar to cooperate with China to realize these goals. She expressed appreciation of China's proposal to build the China-Myanmar economic corridor, saying the initiative is highly matched with Myanmar's national development plan. Suu Kyi said that by participating in the corridor building, Myanmar hopes to cooperate with China in such priority areas as transport and electricity. They are the two sectors facing problems that call for urgent action in the country, she added. Myanmar would like to develop synergy with China on the proposal of building the economic corridor at an early date, she said. On the Rakhine state issue, Wang Yi said at the talks that it is complex and can only be properly addressed between Myanmar and Bangladesh through friendly consultations. He called on the international community to create necessary conditions and an enabling environment for the settlement of the issue. According to Wang, China has proposed a three-phase solution to help settle the issue. Suu Kyi said Myanmar values the understanding for the country China has expressed on the Rakhine state issue and agrees to the China-proposed three-phase solution. The Myanmar state counsellor hoped that China continues to play an important role in pushing for the early settlement of the Rakhine state issue. After the talks, Wang Yi and Suu Kyi attended an agreements exchange ceremony as well as an unveiling ceremony of a Chinese cultural center.